The K2 Manifest takes the best of a few models from K2’s past line like the Turbo Dream and Slayblade to combine them into a new board with its own personality. We put a lot of time on this ride and it really fared well against many of our favorites. Flex: One demo 159 felt stiff like boards from the early 00’s but the second one felt more medium/stiff tip to tail as well. Sizing: The 159 felt perfect for my size 9 boots and Peter’s but Grant, at size 11, needed the 157w or 160w to eliminate toe/heel drag. 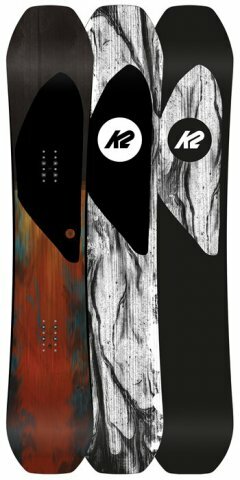 On Snow Feel: There was a nice stable feel to the K2 Manifest that doesn’t feel like there is too much consequence if you skid a turn or two but it still prefers a more technical/semi-aggressive to aggressive rider. It’s just barely catch free enough to be intermediate. Super easy to one foot and flat base with. Feels like a forgiving camber ride but its a little more catchy than your average hybrid all mountain shape. Edge Hold: Like I said in the vid it’s about a 3.5 out of 5 and although it’s not a hard snow specialist it holds pretty well. If you aren’t into disrupted side cuts then you will really like the way the K2 Manifest’s edges interact with the snow. It grips enough in hard situations but never grabs in softer snow. Turn Initiation: pretty fast edge to edge and it likes to initiate quickly with the slightest pressure on the edge. 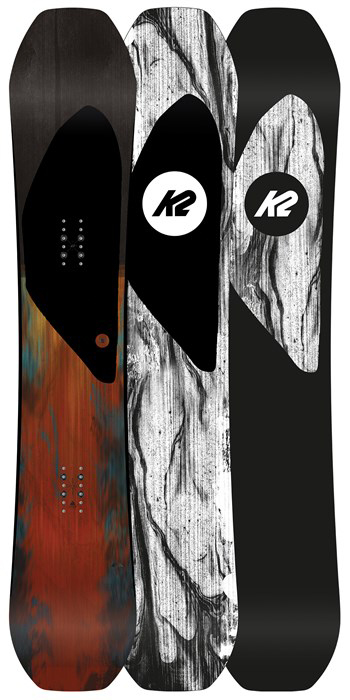 Turning Experience: The overall turning feel on the K2 Manifest is really fun and it likes to turn quick and hard. You would think it’s a bit hookey but I never felt it to be weird between turns. It really likes tighter radius turns but if you want to make wider turns or long narrow s-turns that are just shy of straight lining it can do that without being hookey. It’s a very versatile turner. Carving: Really likes to lay it out in good snow and I could make small circle carves in places I normally couldn’t. It’s not the most springy board out there but it sure gives back at the end of the turn so it sets you up for the next one. Speed: The demo that was super stiff was a bomber and felt like most freeride boards but the production model K2 Manifest was a little more dialed back. It can still bomb like a champ though. Uneven Terrain: It felt really comfortable weaving in and out of bumps with it’s more old school waist widths. I would prefer this board over many others when it comes to weaving in and out of bumps. It also absorbed chatter with crappy uneven groomers very well. Powder: We never got a true powder day but with the 4.25″ set back on board with a 22″ stance width, the longer nose and early rise I don’t see why this wouldn’t float almost as well as many of our favorite all mountain boards like the Loaded Algernon. With what powder we did have the K2 Manifest floated super easy with not even a bit of rear leg burn but that’s expected with boards like these in about 6″ of powder. Buttering: There was an easier break near the tip/tail with the second board that we believe to be the production model that allowed us to butter much easier than the demo model. I could barely get the first to flex underfoot. Switch: The K2 Manifest was not perfect but a little better than what you would think for its shape. Even though it seems like there is a little more rocker in the nose than tail it still felt similar tail forward to nose forward which is good for those that want to treat groomer days in a mtn freestyle way. Jumps: It was very easy to ollie and although not the poppiest board out there it’s got good spring off natural terrain. It’s also great for kickers of almost any size. It’s not the most stable platform underfoot for approaching/landing kickers but it’s still very very doable. The more traditional narrow waist with what seems like a pretty deep sidecut seems like it would be sketchy to some more jump friendly boards with a wider waist and less turny side cut but it was nowhere near as bad as I thought it would be. Jibbing: None of us jibbed with this thing and didn’t even think about doing so. I think it would be fine with more mellow boxes, bonks n such but it’s nothing you want to lap the park with. Pipe: If the pipe isn’t too Icy I personally couldn’t ask for a better board. So all in all the K2 Manifest is a great one board solution that can do everything well. It really hung in there with many of our favorite all mountain boards and it’s a very recommendable ride. We try to get as many images of the K2 Manifest, but forgive us if they're not all there.